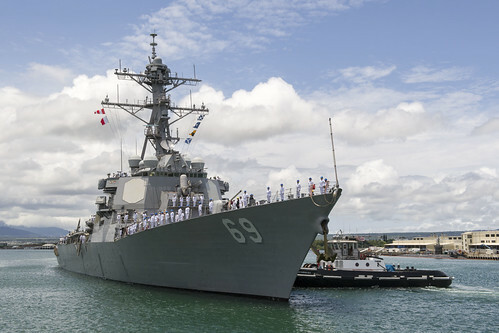 PEARL HARBOR - The Arleigh Burke-class guided-missile destroyer USS Milius (DDG 69) arrived in Pearl Harbor, May 4, for a port visit. "We are grateful and excited to have the opportunity to stop in Hawaii," Cmdr. Jennifer Pontius, Milius' commanding officer said. "This not only provides the crew some much-earned liberty, but allows us to wrap up final deployment preparations prior to our arrival to Japan." In the past year, the crew completed a challenging training cycle and combat systems testing after receiving major upgrades to the Aegis Combat System, undersea warfare, and electronic warfare suites. The testing included Combat System Ship's Qualification Trials as well as multiple live-fire events for operational testing of new weapons technology. Electrician's Mate 2nd Class Christopher J. Pasimiofield expressed his excitement about the visit to Hawaii. "I am looking forward to experiencing Hawaii as we travel to Japan," said Pasimiofield. "I want to visit the USS Arizona Memorial to honor those fallen during the Pearl Harbor attack and bear witness to a piece of our military history."